You’d think that the nitty gritty details of your facebook life are exposed to your friends and your friends alone. NOT! Facebook Apps have access to your secrets! 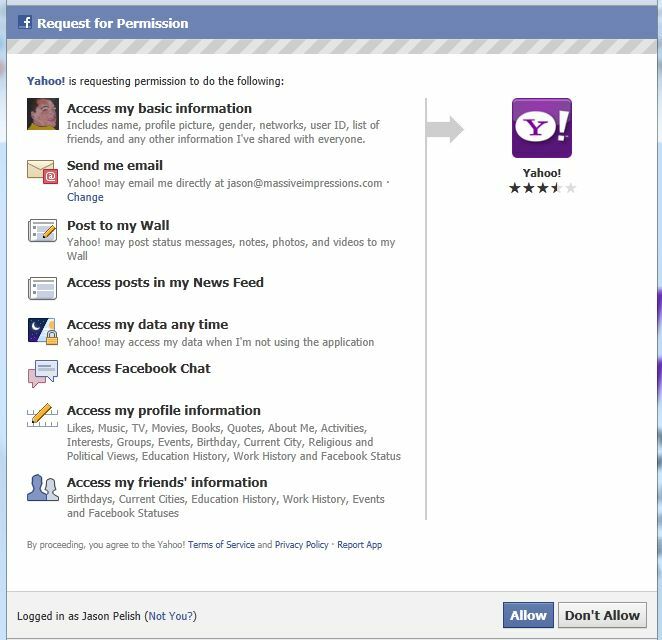 Do you know what permissions you’ve given to apps you’ve “Liked” on Facebook? Probably not. You’ve probably clicked “OK” one too many times without realizing what it means to your privacy, what the apps can see, and what abilities the apps have to make changes to your facebook profile without your further approval and notification. Yikes huh? They can even see your photos and your friend’s photos. So if an app can manage your friend list and then do things on your behalf then imagine the possibilities for trouble. The permissions dialog shown here is a good example of a one that isn’t shy about asking for everything. It wants to send you e-mail, post to your wall, get your friend’s profile information. Yeow Yahoo. What would they do with all that power any way? I’m personally afraid to find out, so if someone’s installed it, please let me know. How would you even find out what you’ve given apps permission to do? In Facebook, select the Account > Account Settings option in the upper right hand corner of the browser window. Then select the “Applications” setting. Here you can see which applications, or more importantly which application developers, can see and control your profile.